The narrator, like Ondaatje, is a writer who lives in Canada. He is remembering his passage through the rites of childhood into adulthood while sailing, as Ondaatje did, from 1950s Sri Lanka to join his divorced mother in England. He hasn’t seen her for several years and is afraid she won’t know where to find him when he disembarks after three weeks at sea. We don’t discover the boy’s name until page 58, when he replies to a fellow passenger who asks for it: ‘“Michael,” I said.’ We learn that Michael, aged eleven, is a former pupil of St Thomas’ College at Mount Lavinia, Sri Lanka (as was Ondaatje) and will later attend Dulwich College in England (as did Ondaatje). Ondaatje has played a variation of this game before. Running in the Family, published in 1983, is a memoir that reads more like fiction. ‘I wanted to touch them into words,’ he wrote about his initial desire to travel back to Sri Lanka from Canada and recreate his unknown family. Almost thirty years on, The Cat’s Table presents us with the reverse: fiction that reads more like memoir. Michael is one of three boys who are travelling unaccompanied on the voyage. The other two are the asthmatic Ramadhin and the exuberant Cassius, who continues the Ondaatje tradition of endowing vivid characters with names borrowed from the past (cf. Cato from In the Skin of a Lion and Caravaggio from In the Skin of a Lion and The English Patient). These Sri Lankan children are unused to stairs, to blankets, to sandals; they are ‘naked with innocence’. The Cat’s Table, at the opposite end of the dining room from the Captain’s Table, is as fellow-passenger Miss Lasqueti remarks, ‘the leastprivileged place’ on the ship but to the boys it’s a convenient outpost that offers them a chance to escape all order. On the cusp of sexual awareness, the boys are baffled by its mystery. They’re entranced by a roller-skating Australian girl who showers fully clothed on deck (‘the gush and spray of it’) and they are never sure what they are witnessing from their nocturnal hiding places ‘so that our minds were half grabbing the rigging of adult possibility’. Michael’s cousin, Emily, is on board. She’s a few years older and half mother figure, half crush. He spends one lonely morning weeping in her bed, where he suddenly feels a thrilling desire he can’t understand (‘It was as if with its existence I was lacking something essential, like water’). 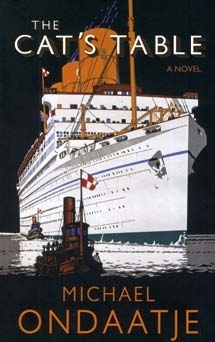 His experiences will make a stranger of his mother when he meets her on the docks at Tilbury. Emily, we discover, has a disguised life, as do many of the other passengers, including a deaf girl, a dumb tailor and a blind Perera (a linguistic joke – unlike the Pereira family, this one has no ‘i’). People have hidden scars. And when someone is murdered on board the boys, again, don’t understand what’s happening, and this occludes our own understanding of events. (‘Was it all part of a boy’s fervent imagination?’) There’s a subplot about a key which could be metaphorical or actual, but reading The Cat’s Table for its thriller aspects would be like reading The English Patientfor an analysis of Rommel’s desert strategy. Ondaatje is a poet and in his novels the action is often fitted around the imagery, which can make for a beautiful but baffling read; however, The Cat’s Table is relatively linear. There are leaps forward in time – we learn about the adult Ramadhin and Cassius and there’s an entire Tuscan section about Miss Lasqueti that seems to have been beamed in from another book altogether – but, mostly, we stay cocooned within the rhythm of ship life. When Michael meets Emily many years later on an island near Vancouver, there’s hardly need for him to remark that the ferry ride feels like an echo, ‘a small rhyme from the past’ because we, too, are still on board. The Cat’s Table is published in the UK by Jonathan Cape and in the USA by Knopf.